Crochet Pattern Marguerite Jacket Girls 2-12 years PDF ONLY! !Think springtime sweetness, think fields and meadows filled with daisies! Capture the soft, girly pink of spring and adorn your little Princess with this delicate and festive jacket! This piece boasts a stylish buttoned front with sweet contrasting trim and darling tiers of ruffles for extra flair. But turn around and add more panache to the already exciting look! A delicate silky ribbon woven in the back of the jacket adds the perfect finishing touch to delight the lucky wearer. Perfect for an Easter egg hunt or for visiting the Easter Bunny, this jacket keeps chilly weather at bay and is sure to become a favorite to be worn again and again. Shown: Omega Perle (100% mercerized cotton; 178 yd [163 m]/1.76 oz [50 g]): 4 (4, 5, 6, 7, 8) balls of #522 pink (MC) and 1 ball of #501 white (CC). 25 sts x 20 rows = 4” (10 cm) in Body pattern. 22 hdc x 17 rows = 4” (10 cm). 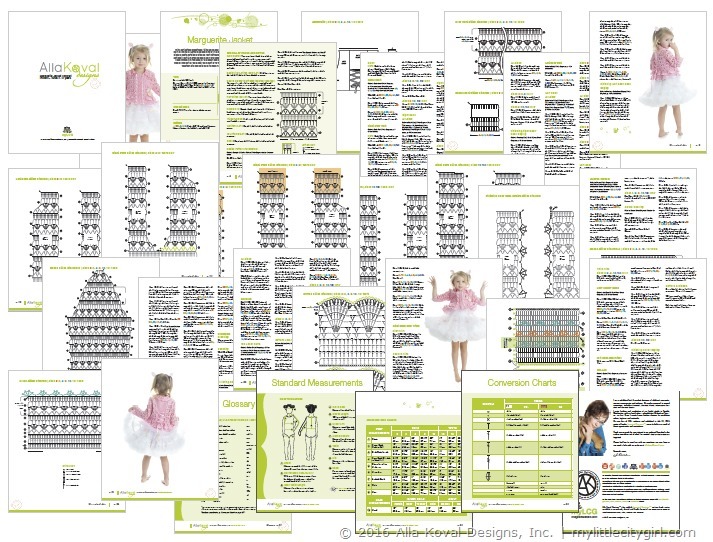 34 pages, 5 photos, 18 crochet stitch diagrams, schematic, technical pages: Glossary, Standard Measurements, Conversion charts charts. You are more than welcome to sell items made from AllaKovalDesigns™ patterns. Credit to the designer is greatly appreciated (example: pattern is designed bywww.AllaKovalDesigns.com) but not required.